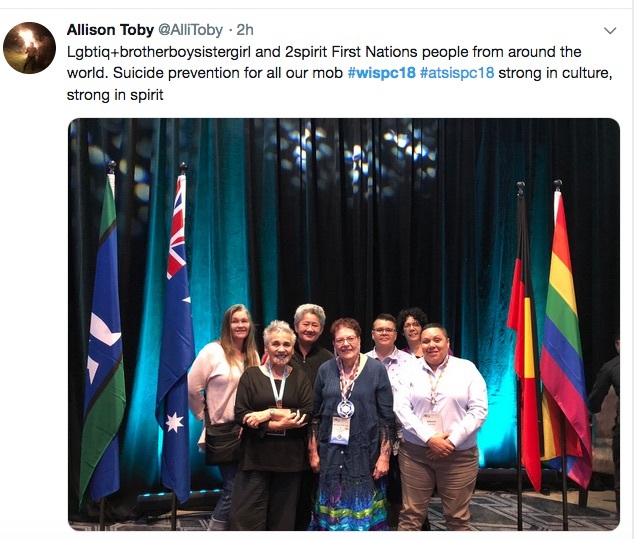 Brotherboys, Sistergirls and other Indigenous LGBTQI+ people were centre stage of discussions at the recent National Aboriginal and Torres Strait Islander Suicide Prevention Conference and the World Indigenous Suicide Prevention Conference in Perth. 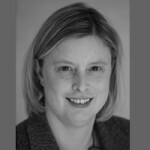 It was a measure of inclusion and care that sets an example for other health conferences, whether in suicide prevention or broader health issues. Please note this story refers to Aboriginal and Torres Strait Islander LGBTIQ+SB people, referring to Lesbian, Gay, Bisexual, Trans, Intersex, Queer, Sistergirl and BrotherBoy people. 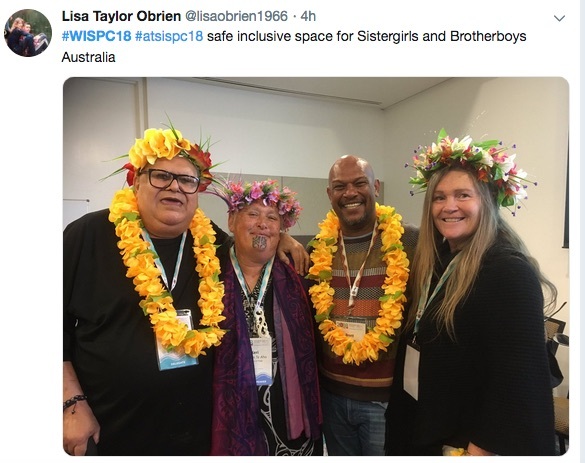 Sistergirl and Brotherboy are terms used by Aboriginal and Torres Strait Islander people to describe gender diverse people who have either a female or male spirit. It was a powerful statement of inclusion. 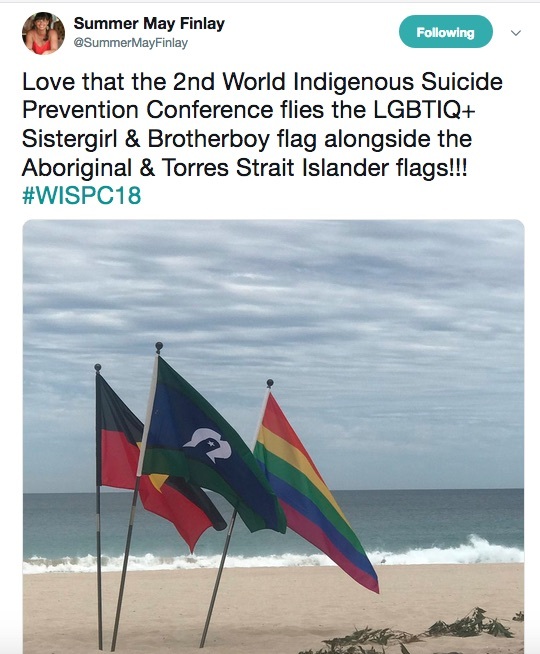 The Rainbow flag flew proudly alongside the Aboriginal and Torres Strait Island flags in the plenary room at the recent National Aboriginal and Torres Strait Islander Suicide Prevention Conference and the World Indigenous Suicide Prevention Conference in Perth. Just as powerfully it stood alongside them on Scarborough Beach for the vibrant two-hour welcome ceremony for Indigenous peoples from across the globe. But the visibility of Brotherboys, Sistergirls and other Indigenous LGBTQI+ people was not just symbolic at the conferences. Their issues of concern were centre stage over four days of discussions and presentations, with a dedicated stream of LGBTIQ+ topics at both conferences and in keynote addresses. 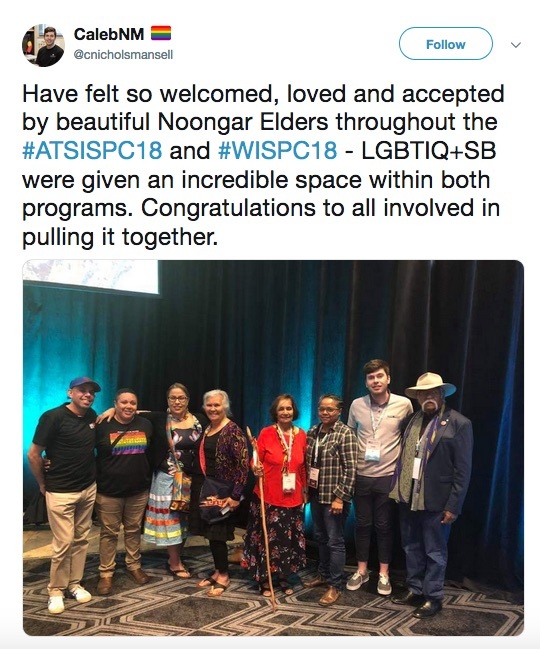 It was the biggest profile and presence yet for LGBTIQ+SB people at a national Aboriginal and Torres Strait Islander conference, according to Rebecca Johnson, co-founder of the IndigiLez Women’s Leadership & Support Group and a member of the conference organising committee. “We felt we were visible,” she said in her report back from LGBTIQ+SB delegates to the closing session of the conference. “(We) felt safe, grounded, heard, valued and extremely grateful to be with our mob and safely within our mob,” Johnson said, giving particular thanks to the local Nyoongar Elders, led by Aunty Liz Hayden, for “extending their love and support for us”. 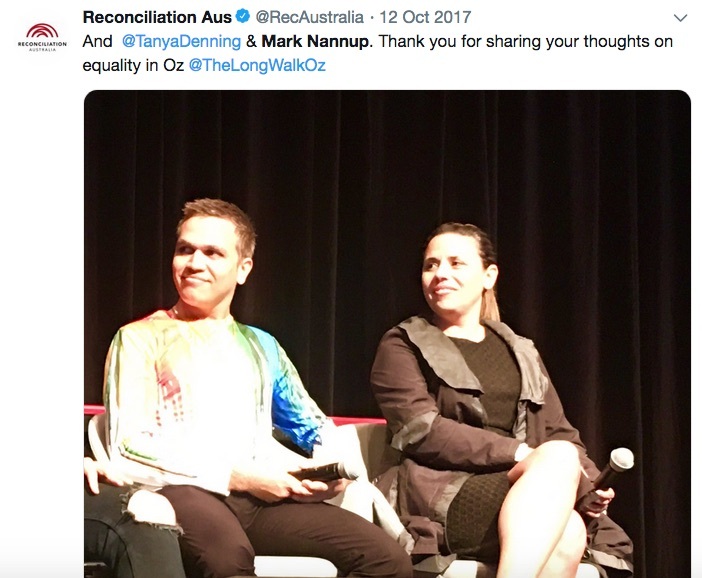 It was a critical act of inclusion for Aboriginal and Torres Strait Islander LGBTIQ+ people who, the conference heard, experience a “double whammy” of discrimination ­– for their sexual identity and gender diversity within the Aboriginal and Torres Strait Islander communities and for their cultural identity from non-Indigenous LGBTIQ+ people. In multiple sessions, the conference heard stories of lived experience and calls for inclusion and respect for Aboriginal and Torres Strait Islander LGBTIQ+SB in their own families and communities, in community controlled organisations and services, and in mainstream and LGBTIQ+ services, policies and frameworks. It also heard the need for better data collection to determine where support and services are needed. 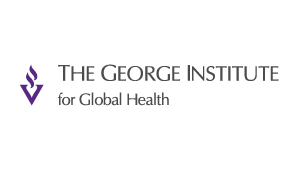 Dion Tatow, chairperson of gar’ban’djee’lum, a Brisbane-based support network for Aboriginal & Torres Strait Islander LGBTI+SB people, said there are two groups in Australia at high risk of suicide — Aboriginal and Torres Strait Islander people and those who identify as LGBTIQ+. “We cop a double whammy,” he said. 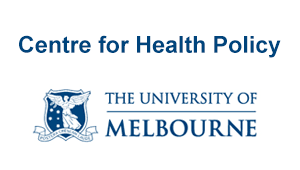 But despite that, he said, there is very little research on Aboriginal and Torres Strait Islander LGBTIQ+SB people and their wellbeing, including protective factors, with most focused on HIV rather than mental health. “There are currently no protocols for identifying us in the suicide and self harm statistics,” he said. 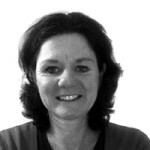 In her keynote address, Rebecca Johnson, a Gooreng Gooreng woman who is connected to the Tarlibelang Bunda people and has worked for more than 20 years experience in Aboriginal and Torres Strait Islander and #LGBTQ+SB issues, talked about the importance of visibility – and not just at conferences. 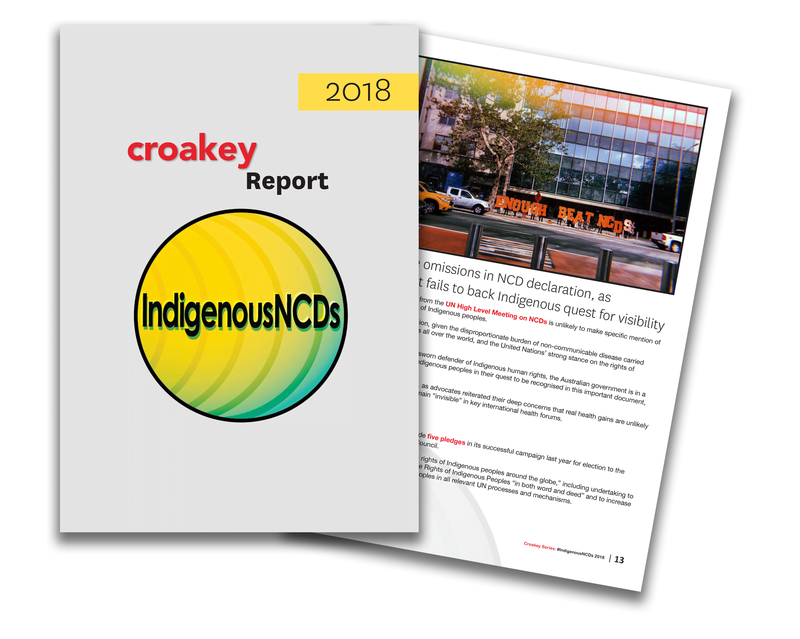 It’s needed at every level in shaping services, policies and frameworks across Aboriginal and Torres Strait Islander, LGBTIQ+ and mainstream organisations and to ensure they have the capacity and capability to provide safe healthy spaces for Aboriginal and Torres Strait Islander LGBTIQ+BS people, she said. 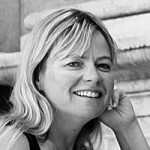 “It has to be a collaborative approach,” she told the conference. Johnson said Aboriginal and Torres Strait Islander LGBTIQ+SB people experience invisibility in multiple settings. 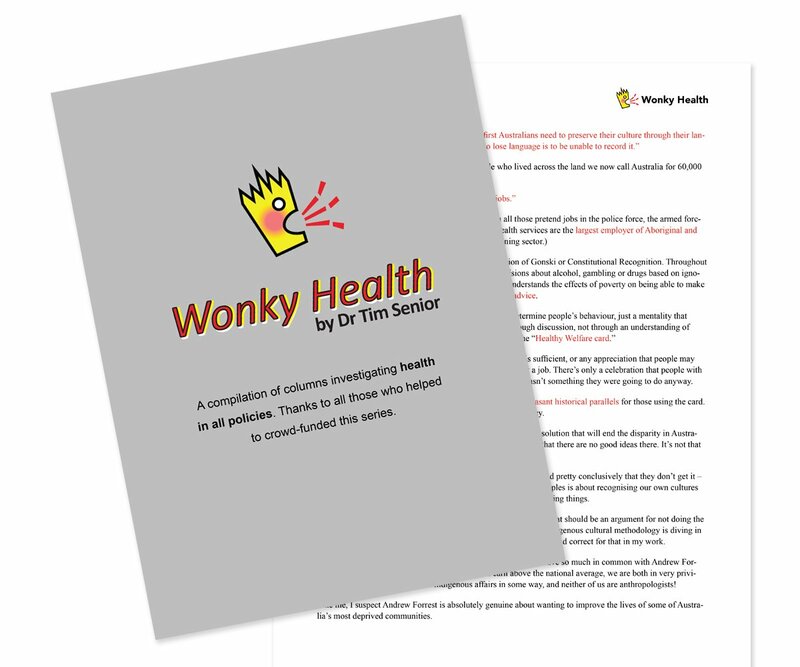 It comes when LGBTIQ strategies and plans are rolled out in health and education without consultation with Aboriginal and Torres Strait Islander LGBTIQ+SB people. 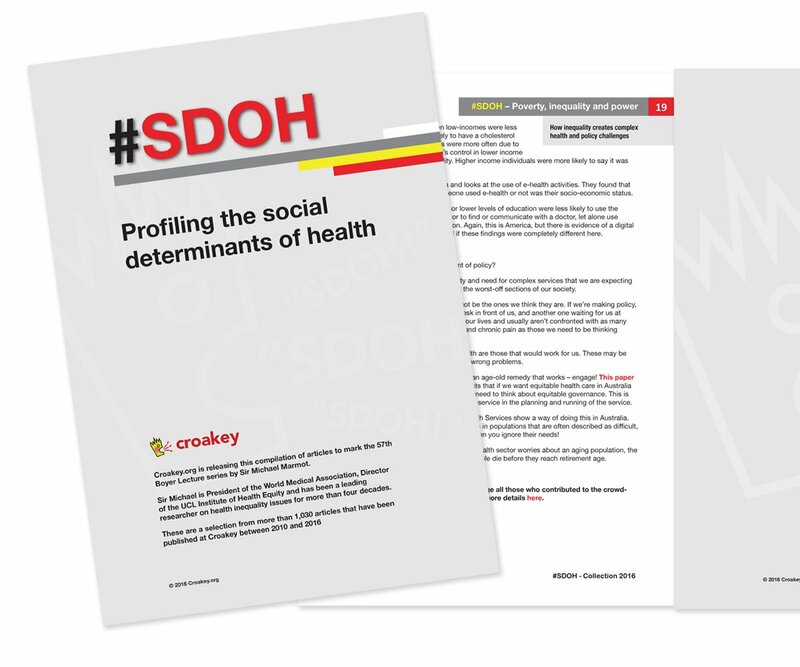 It’s to be found in LGBTIQ organisations and promotions that are not culturally safe, and in mainstream, LGBTIQ and community controlled health services that don’t understand the particular health needs and experiences of Aboriginal and Torres Strait Islander LGBTIQ+SB people. The same fight we have for Indigenous affairs across this nation we have inside the LGBTIQ+ non-Indigenous sector. 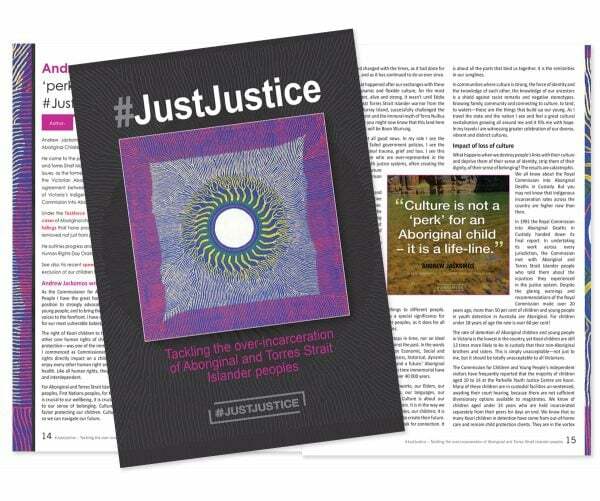 We are still fighting the good fight of who we are as Aboriginal and Torres Strait Islander people and what our intellectual rights are to hold on to our knowledge and experience inside the sector. We’re asking the questions inside the non-Indigenous organisations that receive all the bungoo [money]. Tatow, who is an Iman and Wadja man from Central Queensland and South Sea Islander, raised similar concerns, saying gar’ban’djee’lum members actively look to join and take on roles in mainstream LGBTIQ+ organisations to “make sure they are culturally safe”. The group, largely run by volunteers, has been selected to lead a suicide prevention awareness campaign for the whole Aboriginal and Torres Strait Islander community in Queensland, as well as for Aboriginal and Torres Strait Islander LGBTIQ=SB people. “This is self determination in practice for us,” he said. At a session titled “A minority within a minority”, Tatow talked about the compounded and layered discrimination experienced by Aboriginal and Torres Strait Islander LGBTIQ+SB people, “where some non-Indigenous gay men are some of the most racist men I’ve ever met”. “We are copping racism from the LGBTIQ community and stigma and discrimination for being gay from the Aboriginal and Torres Strait Islander community,” he said. It is not our sexual orientation and gender identity that is the cause of our high rates of suicide. It’s all the things we cop because of it, the racism, the exclusion, the discrimination and violence'”. The conference also heard strong stories and messages about discrimination experienced by Aboriginal and Torres Strait Islander LGBTIQ+SB from their own families and communities. Johnson told the heartbreaking story of a young woman who had been involved in the Indigilez group for a few years in her late teens. 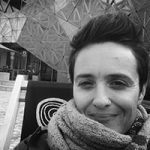 She had started to develop a sense of pride in her identity as an LGBTIQ+ woman, but had been confronted with “layers of exclusion” when she returned to her regional hometown. “She lost her fight and she’s no longer with us,” Johnson said. “These are the impacts of exclusion and isolation. She told the conference that there are huge repercussions for the social and emotional wellbeing of Aboriginal and Torres Strait Islander LGBTIQ=+SB people who are segregated by stigma and shame from family and communities. 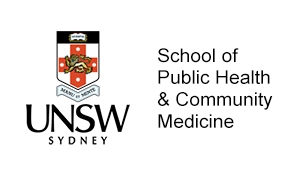 The impact of discrimination on the mental health of Aboriginal and Torres Strait Islander LGBTIQ+SB people is currently being investigated in the Breaking the silence research project being currently led by Braden Hill at Murdoch University. 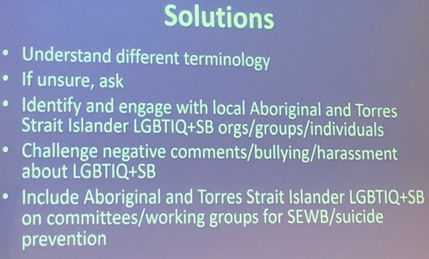 Hill told the conference the project will focus on the ‘silences’ related to being Aboriginal and Torres Strait Islander LGBTIQ+SB – those within families, communities and, particularly, within policy and service delivery. See related tweets below. 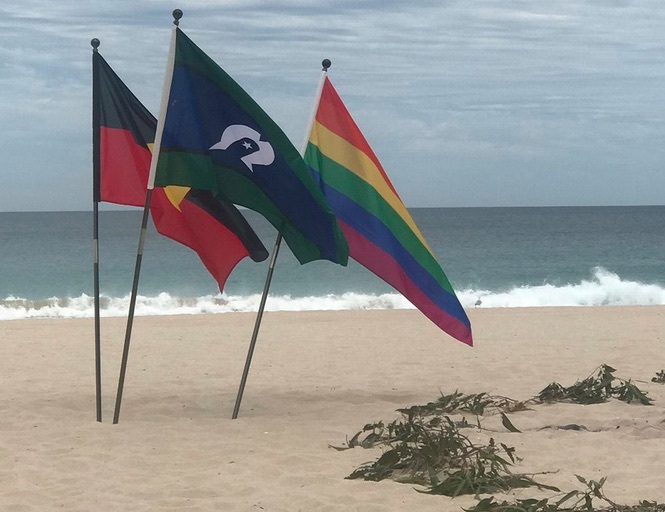 Johnson said the gar’ban’djee’lum network will next year host cultural healing retreats that enable Indigenous #LGBTIQ+SB people to spend time on Country, “with their old people”. “It’s about enhancing cultural resilience, about enhancing wellness and our social and emotional wellbeing, for our ways of being, knowing and doing: country, mob, language, community, all the things that make us who we are as Aboriginal and Torres Strait Islander people,” she said. She challenged all delegates to “dig deep into your heart and get to know and understand the experience of Indigenous LGBTI people”. Issues of acceptance by your own community were also highlighted by Sade ‘Heart of the Hawk’ Ali, a Canadian First Nations person now living in the United States and working at the Zero Suicide Institute. She talked about her experiences as a Two Spirit person – “what you call LGBTIQ+” – who she said were held as holy people in Indigenous communities in north America prior to colonisation but now suffer much discrimination. She showed a photo of herself (far left) at the historic Standing Rock protest, the Native American-led movement that rose up in 2015 in opposition to the Dakota Access pipeline being built just north of the Standing Rock Sioux reservation. 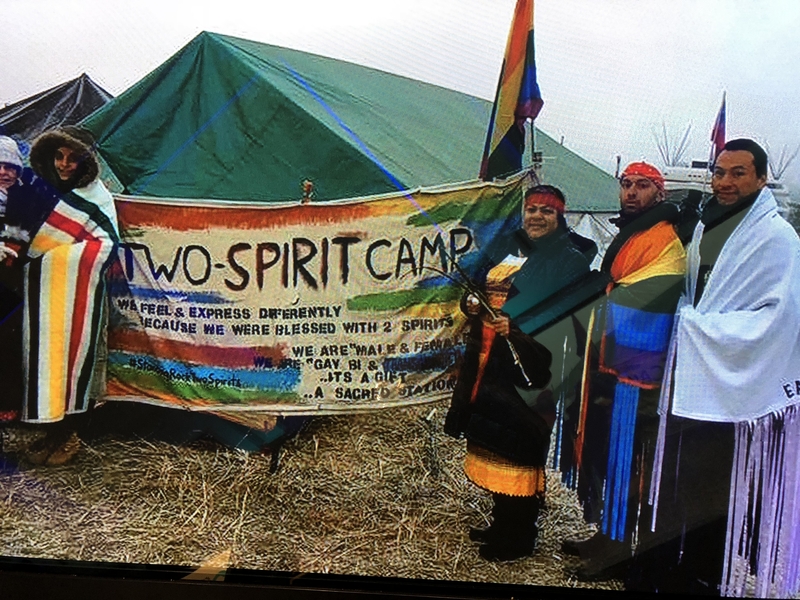 The Two Spirit Camp was given an honoured place at the created right in the middle of the protest, but she described the pain and hurt of later being excluded from an important ceremony by one woman after being introduced as a Two Spirit Elder. 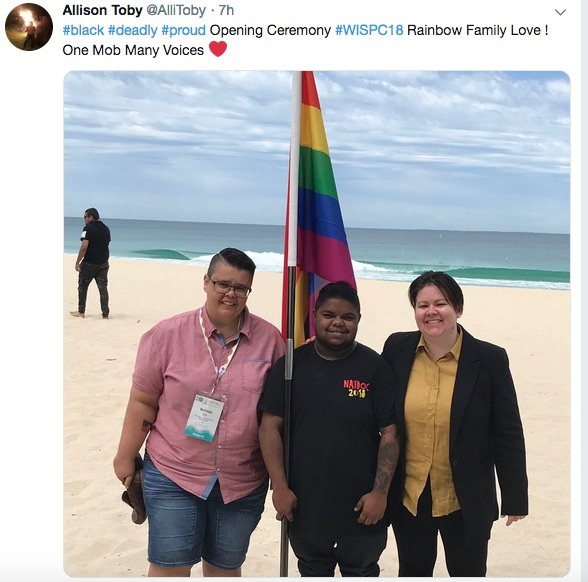 Ali said she had been moved to see how much attention had been paid at the conferences in Perth to LGBTIQ+SB people, and urged that that focus stay strong beyond its discussions, in research and service delivery and other community support. “We need to pay attention to the whole community, to all of us, not some over here and some over there. 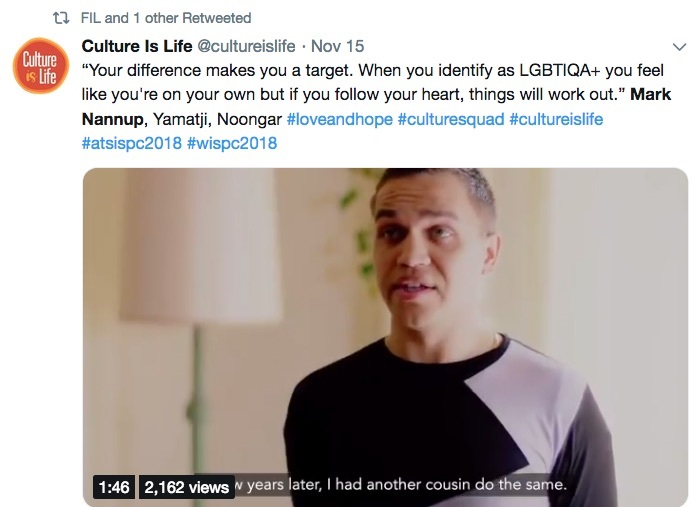 Watch this Culture is Life video from presenter Mark Nannup, Yamaji and Noongar man, and Culture Squad ambassador. 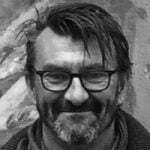 He talked at the conference about his role in ensuring stronger Aboriginal and Torres Strait Islander LGBTIQ+SB representation in high profile LGBTIQ events, like the Pride March and Midsumma Festival. 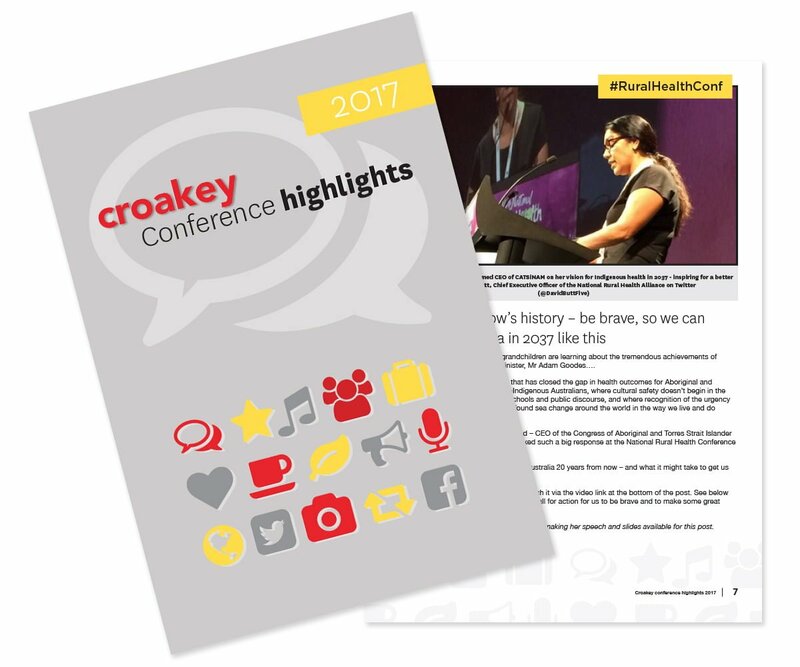 • Summer May Finlay and Marie McInerney are reporting from #WISPC18 for the Croakey Conference News Service. More reports will be published in coming days.